Handbell Musicians of America is dedicated to advancing the musical art of handbell/handchime ringing through education, community, and communication. Overtones is the Guild’s official bi-monthly journal, the purpose of which is to provide a printed resource of the highest standards to support and enhance the mission of the Guild. 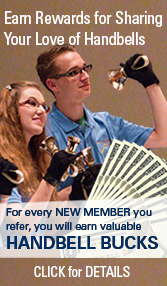 We welcome articles about handbells, handbell music, techniques, and people. We accept both solicited and unsolicited in-depth feature stories, interviews, how-to articles, and news items as well as installments to our regular columns. Articles accepted will be published according to a schedule determined by the needs of the magazine and may be edited based on content and style considerations as well as space constraints. The best way to gain a sense of our needs and style is to look at previous issues. For information about ordering back issues, please visit our website’s Overtones page. You may also download selected sample articles from the site. We welcome news coverage of happenings in the various areas, including special awards given to area VIPs and articles, individuals or groups who have received a special honor related to their involvement in handbells or music, and any newsworthy happening. Please include photos where appropriate. FEATURE ARTICLES: Features should be in-depth stories of interest to handbell musicians. They may be coverage of a special or unique handbell event or a profile of a unique handbell ensemble. A typical feature will be 1200 to 2000 words. If you have an idea for a feature article but are not sure whether it will work for the publication, please do not hesitate to contact the editor (jrsmith@handbellmusicians.org) about your idea. Photos are strongly recommended. INTERVIEWS: We welcome interviews with well known handbell musicians as well as other individuals who have a special or unique impact on the handbell community. Interviews may be written as a narrative profile or a series of questions and answers with a narrative opening and conclusion. Photos, both historic and current are strongly recommended. Avoid merely presenting a biographical sketch of a group or an individual. Rather, focus on what makes the ensemble special or unique. Or in the case of an individual, what inspires or motivates the person. Ask yourself, what can others can gain by reading about a particular group or individual—knowledge, inspiration, motivation, etc. Department articles should be approx. 800 to 1200 words, depending on the material covered. Photos, diagrams and examples are encouraged. Department articles should be more specific than general. HANDBELLS IN EDUCATION: Focuses on topics relating to the use of handbells and handchimes within the educational system. Topics may include the use of particular educational materials, specific techniques peculiar to using handbells and handchimes in an educational setting, profiles of existing school handbell and handchime programs, or how handbells and handchimes can be used to enhance specific areas of education. HANDBELLS IN WORSHIP: Includes suggestions, ideas, and specific issues relating to using handbells in a worship setting. 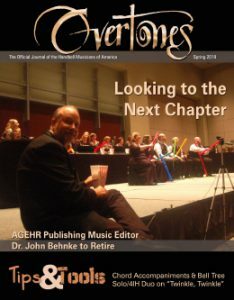 Articles may include ideas for ways to enhance a particular type of worship setting using handbells, ways in which handbell music may be used to present the liturgy, etc. COMMUNITY CONNECTIONS: Geared toward community and performance ensembles. Topics may range from recruiting personnel to choosing concert repertoire to dealing with venue problems or any other topic unique to these types of groups. MUSIC REVIEW: Music review articles should follow a particular theme, such as music for beginning choirs, seasonal music, music for youth, etc. Please include 8-10 pieces from various publishers, two or three of which are published by AGEHR. Please use the following format: Begin with an introduction, followed by the pieces you are reviewing, then any further remarks or conclusion. For each piece please include the title, composer and arranger, publisher and publisher’s catalog number, range, level, instrumentation, followed by your review of the piece. Writing should be clear, accurate, and concise and in a conversational style. For appropriate writing style and word usage, consult The Chicago Manual of Style (The University of Chicago Press). Articles must be submitted with the author’s name, address, daytime phone number, and e-mail address. Features and department articles must be accompanied by a brief one-paragraph biography including position, education, etc. and a head-and-shoulders photograph of the author. Deadline for submissions is on the 1st of the month, two months prior to publication date. Articles must be submitted with the author’s name, address, daytime phone number, and e-mail address. Features and department articles must be accompanied by a brief one-paragraph biography including position, education, etc. and a head-and-shoulders photograph of the author. E-MAIL ATTACHMENT: Send a file written in Microsoft Word. Suggested italics, bold words and other formatted characters are acceptable. If using software other than Microsoft Word please save your file as ASCII or “Text Only,” unless your software offers the option to save as a Microsoft Word document. Please do not indent paragraphs. Rather, use a double line break between paragraphs. Please send the file as an attachment, not as the body of the email message. HARD COPY ARTWORK AND PHOTOGRAPHS: Each piece should be mounted on a separate sheet with captions and should be clearly identified in the text, as it is often not possible to print an illustration adjacent to its reference in the text. All types of illustrations must be high contrast and camera ready. DIGITAL ARTWORK OR PHOTOS FROM DIGITAL CAMERAS: Black and white line art should be an EPS file or a 600-dpi or better TIF file. Photographs must be scanned at a minimum of 300 dpi and saved as a TIF file. JPEG files are acceptable provided they are saved at the maximum quality possible. 72 dpi web graphics and photos are not acceptable for print. Photos from digital cameras should be sent full size. MUSICAL EXAMPLES: Musical examples may be submitted as an EPS, high-resolution TIF, or Finale file. Please note: All photographs must include a caption, the photographer’s name, and a statement certifying that the author has parents’ or guardians’ permission to publish the likenesses of any minors. Please do NOT paste your illustrations into the text file of the article. Please send them as separate attachments. Illustrations, examples, diagrams, tables and photographs will not be returned. No manuscript may be simultaneously submitted to other publications. Upon publication, the article becomes the property of Handbell Musicians of America. The author may not reproduce or reprint portions of the work without permission from Handbell Musicians of America. Authors must secure advance permission to use musical examples or other printed works protected by copyright. Please include the publisher’s permission notification. Interested in placing an ad in Overtones? Check out our advertising rates and place your order today!